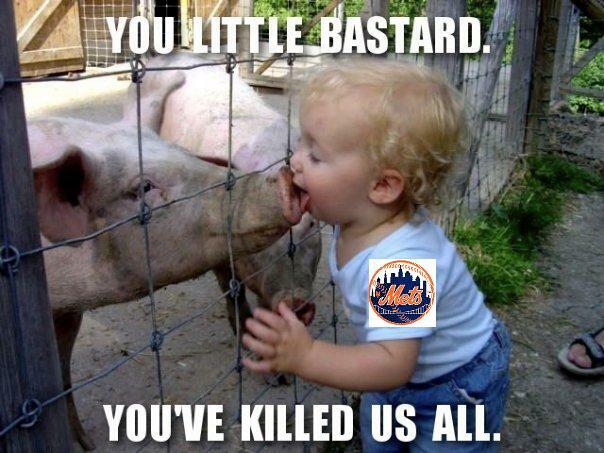 MYFOXNY.COM – A member of the Mets’ traveling party has been hospitalized in Pittsburgh with a possible case of swine flu, according to a New York Post report. The person is part of the SNY broadcast crew that travels with the club, the report said. The crew member is apparently in isolation at the hospital. Meantime Mets center fielder Carlos Beltran is out for the third consecutive game because of a stomach virus. The team believes Beltran is suffering from a gastrointestinal virus and not swine flu. Pitcher John Maine has also been dealing with a stomach illness. So the evidence piles up at the feet of swine flu: A Mets employee who travels with them has some kind of flu, Mets players have some kind of stomach virus (which was also described as “flu-like symptoms”), there have been several cases of swine flu in NY, the Mets play in NY, and it is well known that Carlos Beltran has a pig farm. Ok, that last one was made up, but it could be true, you never know. I wonder what the protocol is for a situation like this. I’m guessing they would have to be quarantined from the rest of the team until they got better, but imagine the implications of this. Pro baseball player gets swine flu, travels to Pittsburgh, infects a Pirates player, Pirates player hangs out with Sidney Crosby while the Penguins are in town for their home games of the Cup, Crosby makes out with 15 dudes, they pass it on to the Red Wings, Red Wings take it back to Detroit who has no hospitals because their city is dying (metaphorically) and then cannot treat the citizens who catch it and then their city starts dying (literally). The Mets could be responsible for the final crushing blow to the City of Detroit. And the loss of the Stanley Cup for the Penguins. The logic needs to be worked out in more detail, but the main idea is still there. This could be HUGE. Stay tuned for further details.